A survey by personal finance site NerdWallet finds consumers remain largely unaware that their banks' overdraft "protection" is optional, costing them $100 or more in fees each year. In 2010, Congress enacted a law requiring banks to allow customers to "opt-in" to this service, in which the bank covers the deficit if a customer makes a debit charge with insufficient funds. However, the bank charges at least a $30 fee for this service. Before the law was passed, banks automatically enrolled their customers. But the NerdWallet survey, conducted by the Harris Poll, found 66% of consumers are unaware of their legal option to pass this up. Being unaware of the law, however, does not mean consumers get automatically signed up -- they still have to opt-in. So why are an estimated eight million consumers enrolled in their banks' overdraft programs? "Overdraft coverage sounds like a good deal, but it’s usually better to steer clear of it," the NerdWallet editors write. "It means banks may charge you a hefty fee when transactions– including debit card swipes–cause your account to drop below zero." If you make a debit purchase that overdraws your account without overdraft protection, the purchase is simply declined at the point of sale. It alerts you if you have insufficient funds in your account, but more importantly, it does not trigger a fee. The NerdWallet editors estimate the eight million consumers who are enrolled in bank overdraft protection end up paying over $3.5 billion in unnecessary fees. 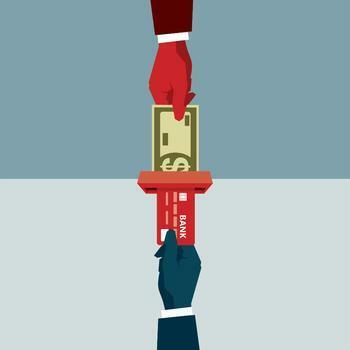 A NerdWallet analysis of data from the Consumer Financial Protection Bureau (CFPB) estimates a consumer who frequently overdraws his or her account pays about $442 in overdraft fees each year. The CFPB has found that the transaction amount on a debit card that leads to an overdraft is quite small -- the median was $24 in 2014. Factor in a $35 overdraft fee, and the real cost of the transaction is $59. “If you’re in danger of getting hit with an overdraft fee, then it’s worth asking yourself if your next purchases are really worth the price that you could pay; often the answer is ‘no,’” said Kimberly Palmer, NerdWallet’s in-house expert on credit cards and banking. Consumers get enrolled in these overdraft programs when their banks send them marketing material, promoting it as a helpful feature. Unless you specifically notify the bank you would like to be covered, it cannot charge a fee when you make a debit purchase with insufficient funds.